You don’t have to be an art freak to enjoy an art museum. The Perez Art Museum Miami (PAMM) is a modern and contemporary art museum that exhibits international art of the 20th and 21st centuries. It’s a prime example of a museum you can take your friends to, even the ones who aren’t into art. 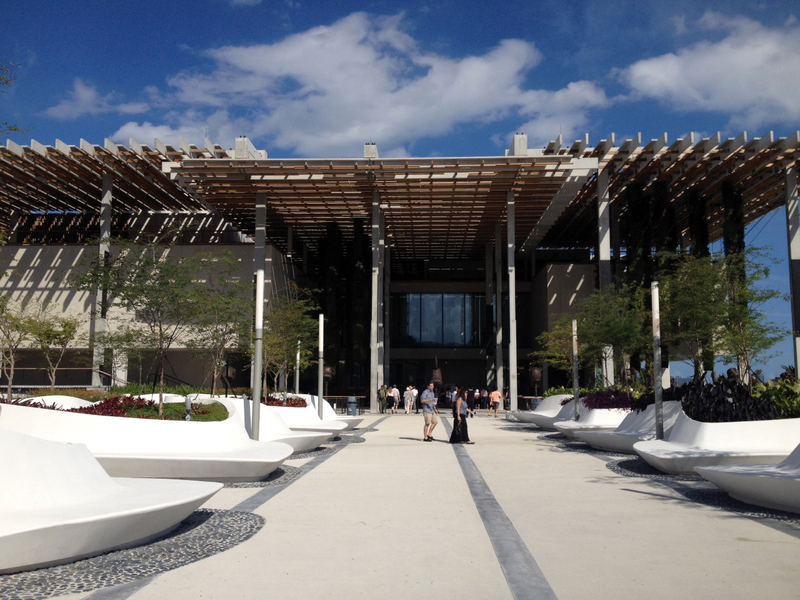 Since its opening in December 2013, PAMM has attracted flocks of patrons, who visit not only for the collection of more than 1,300 works of art, but also to see what else it has to offer. Designed by award-winning architects Herzog & de Meuron, this three-story building is a new addition to downtown. The second you park in the open-air parking garage beneath the museum and begin walking through the surrounding landscape, you’ll know that this building is different from the other downtown buildings. Near the entrance of the museum, you’ll notice the impressive green hanging gardens. Nothing beats looking at a nice view when the weather is good. On the east side of the museum, visitors can sit down and enjoy the view of Biscayne Bay from their seats. Enjoy looking at the relaxing blue water reflecting sunlight, the cars driving on the expressway nearby and, of course, the cruise ships setting sail. Even with so much happening around you’ll feel calm. Get lost in the museum’s two floors of art. You’ll find everything from paintings to photographs to sculptures. If you’re into sculptures, take a look at Monika Sosnowska’s “Market,” an impressive giant green steel sculpture hanging from the ceiling comprised of more than 1,100 pounds of bent steel. Don’t miss the new exhibition of Edouard Duval-Carrie: Imagined Landscapes, a series of his new works over the past year. Duval-Carrie is known for his strong colors, but there are works in this project in black and silver glitter. Visitors flock to “Crystal Explorer” and “After Bierstadt: The Landing” in the exhibition. If art isn’t your thing, then don’t pay admission to the museum and eat at Verde. Enjoy indoor or outdoor seating for your lunch, brunch or dinner. For dinner, your choices range from hamachi sashimi for $14 to bistro steak which has swiss chard, sweet garlic and braised mushroom for $22. Verde is open Tuesday through Sunday from 11 a.m. to 5 p.m. and Thursday from 11 a.m. to 9 p.m. The coffee bar is open from 10 a.m. to 6 p.m. When: PAMM is open Tuesday through Sunday from 11 a.m. to 5 p.m. and Thursday from 11 a.m. to 9 p.m. It is closed Mondays. Where: The museum is located on 1103 Biscayne Blvd., Miami. Price: $8 for students (with ID) and $12 for adults. Free for members of the museum.